The Models Own x Hed Kandi range caught my eye as soon as the press release dropped into my inbox. I painted mine almost immediately with the bright neon coral shade from the collection called Hedonist, but my housemate stepped in to model Ibiza Mix for me. The Models Own and Hed Kandi range reflects the spirit of Ibiza and all things summery. Ibiza Mix nail polish is a fun shade full of multi coloured glitter (pinks, blues, greens and golds) which I think reflect the colour of the sea and the sun all suspended in a clear polish. 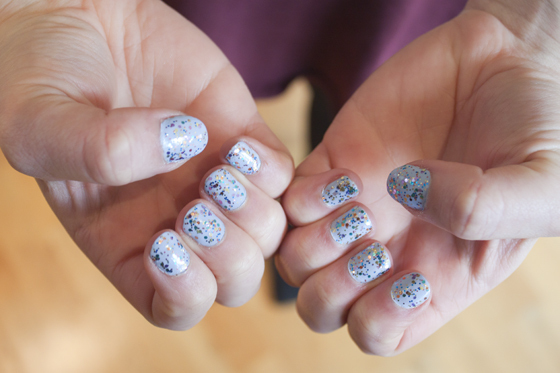 Im surprised Models Own haven't released their own version of OPI's Rainbow connection yet, but this is similar but with more blues and golds rather than multi coloured rainbow. 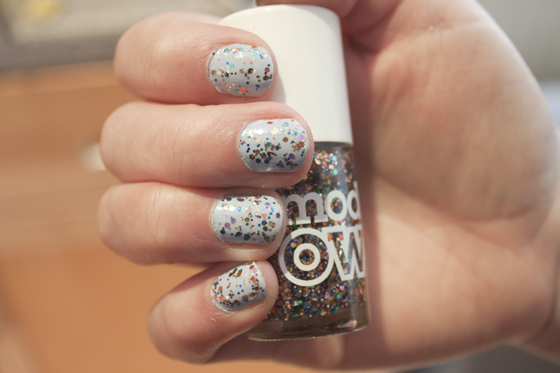 I'd love to see more of these clear glitter nail polishes from Models Own. I highly recommend this shade as its fun and unique and great for layering! I can't wait to use it! These haven't launched online yet but should be in some stores that stock Models Own. I'm wearing exact same combo right now! Well, not exactly the same. I used different nail polishes, but they look just like that. I saw these the other day and have got a definite mental note to go back and pick some up this week as they look so brill! This is the first on my list because it reminded me of rainbow connection which I am a big fan of! Amazing, this definitely gives Topshop's Razzmatazz a run for it's money. I nabbed the last one of these in Boots today- can't wait to try it!